What Accessories Are Available For Your Exhibition Stand? Having a professionally designed pop-up stand or banner stand is definitely a start, but through the use of a wide range of accessories you can make your exhibition display really stand out from the crowd. An impressive looking exhibition stand is one of the biggest factors when drawing in potential clients so accessories should always be taken advantage of when your space allows you to. Lighting is definitely one of the most effective ways to make your exhibition stand pop. Easily installed on both the pop up stand and the banner stand, the lighting perfectly complements the graphic design helping the colours to really catch the eye. The lighting is also adjustable so you can choose where you want people to focus on the banner stand, be it your contact information, company logo or the graphic itself. 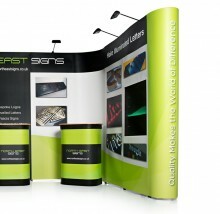 Illuminating your exhibition stand is one way to ensure your brand gets noticed. Available for both the pop-up stand and the banner stand, the media bracket helps to bring vibrancy and movement to your stand. There is an ever growing demand for audio visual equipment on exhibition stands so there is a much greater need for media brackets. It allows you to add a TV or monitor to your stand which allows the use of presentation slides or videos to promote your products and services. 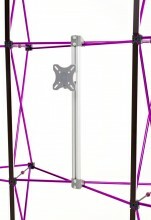 The media stands for both the pop-up and the banner stands will hold a monitor up to 22” wide and 5kgs in weight. helving units are available for our pop-up exhibition stands and provide your stand with more depth that helps to create a physical display area. Shelving units are commonly used to display your literature or products but can be used to display anything you wish. The shelving unit sits neatly within the pop-up and comes with one acrylic shelf included however you can add an extra shelf if required, the unit will also hold up to 10kgs in weight and is available with lights If needed to really make your product stand out. The literature holder is a unique piece of hardware available to banner stands that allows the exhibitor to display various literature such as business leaflets, product flyers, and other marketing materials. The literature holder attaches directly to the base of the stand and provides a simple, sturdy solution for distributing your marketing materials. Desktop banner stands are a traditional retractable banner available in either A3 or A4 sizes, these are a low cost and lightweight way of displaying your branding, perfect for use in conjunction with our branded tablecloths and at smaller exhibitions. Similar to our full size banner stands, the desktop versions are also designed, printed and manufactured in house by our dedicated team to keep quality to the highest standard possible. Branded tablecloths are an excellent way to improve the look of your exhibition stand. They can be used in conjunction with pop-up displays and desktop banner stands to create a visually appealing stand that will catch the eyes of the visitors. Available in 29 vibrant colours and made from a hard wearing 205g poly/cotton weave mix, these branded tablecloths are lightweight and durable. They provide you with a low cost effective marketing tool which promotes your brand and give your company a professional appeal. Our leaflet dispensers are free standing literature holders that are appealing to the eye and are perfect for businesses that wish to distribute their literature whilst at an exhibition. 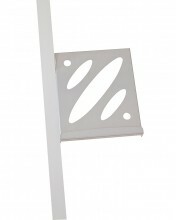 They are also ideal for use in receptions, libraries and showrooms.